I love holidays in general. Don't you? Halloween is just about my favorite, but now that it's over I'm thinking about how much I LOVE Thanksgiving! I love the simplicity of the holiday- food, family, and giving thanks. I also love that Thanksgiving ushers in the magical time of Christmas! As I've said before, my creative mind works in months/holidays. So, with a new month comes a new Pinterest board. Here's my November board. I've pinned a lot of fun ideas for Thanksgiving, and have more than enough pumpkin recipes to fill the entire month. November is pumpkin month for me when it comes to baking. I have one more fun thing so share with you today. In September, I shared some of my father-in-law's fall art. I mentioned my favorite one, but didn't have an image to share. Well, now I do. My father-in-law posted this on his Facebook page a few weeks ago. This painting was done from a picture he took last fall. 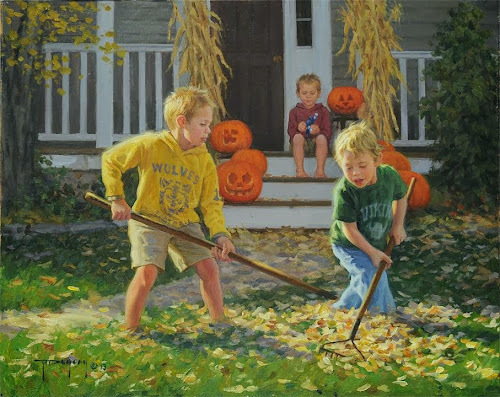 My boys and I were helping (some more than others, notice one of my twins playing with a toy on the steps) rake leaves in my in-law's yard. This is pretty much exactly what the picture looked like. He even captured my boys' jack-o-lanterns' faces perfectly! Not everyone gets to see their children in an original piece of artwork. It's a special thing. My favorite boys and my favorite time of year. Thank you, Robert! It's priceless! P.S. To see my other Pinterest boards, you can click here. Wow! The painting is incredible. When I first saw it I thought it was a picture...looks like it captures personalities, and a perfect season. Love the light too...wow. I'm a bit partial to it as well, Rach! Thanks so much for your kind words. I'll pass the compliments along to my father-in-law. Hope you're weekend is going well!